Smokey Joe Wood, 34-5 in the regular season, started Game 1 for the Red Sox and was just good enough. Trailing 2-1 after six innings, the Sox tallied three in the top of the seventh, Steve Yerkes' two-run single the big blow. The Giants scored a run in the ninth and had runners on second and third with just one out, but Wood recorded his 10th and 11th strikeouts to preserve Boston's slim 4-3 decision. The World Series shifted to Boston for Game 2, and New York's fielders apparently left their gloves back in Gotham. Christy Mathewson started for the Giants and allowed six runs, only two of them earned. Matty pitched all 11 innings, however, and the Giants escaped with a 6-6 tie when the game was called on account of darkness. 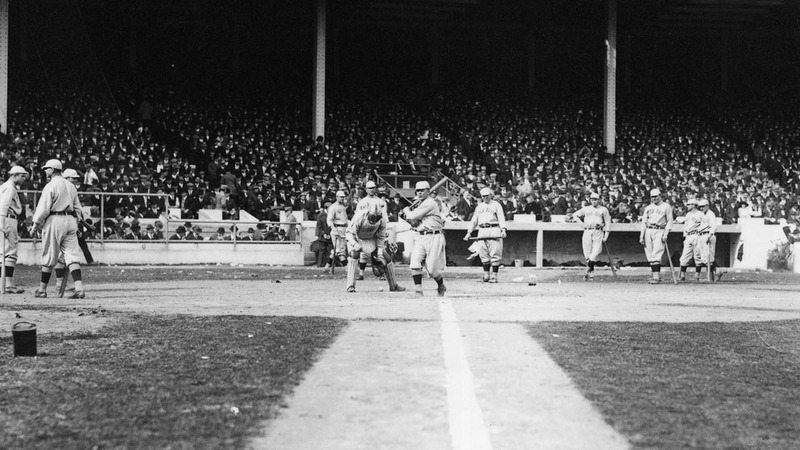 Game 3 was another close one, the Giants taking a 2-1 squeaker behind Rube Marquard's seven-hitter. Joe Wood started Game 4 and recorded his second win of the Series, a 3-1 decision. Wood allowed nine hits, but didn't walk a batter and struck out eight Giants. Back in Boston for Game 5, the Red Sox went up 2-0 in the third inning and held on for a 2-1 victory, thanks to the three-hit pitching of Hugh Bedient. The World Series shifted location yet again for Game 6, and the Giants staved off elimination with five first-inning runs and Marquard's complete game. Final: New York 5, Boston 2. Inning No. 1 was again kind to the Giants in Game 7, as they scored six times and knocked out Joe Wood. Jeff Tesreau, loser of Games 1 and 4, went the distance for New York to capture the 11-4 decision, thus setting up a decisive Game 8. And what a Game 8 it was. Mathewson started for the Giants, Bedient for the Red Sox. Wood replaced Bedient in the eighth inning, and after nine innings the score was deadlocked at a run apiece. New York went ahead 2-1 in the top of the 10th when Fred Merkle's single plated Red Murray, who had led off with a double. So Mathewson, the best pitcher in the National League, took the mound in the bottom of the 10th with a one-run lead. Boston's leadoff man, pinch-hitter Clyde Engle, lifted a lazy fly to center fielder Fred Snodgrass ... who dropped the ball, allowing Engle to reach second base. Snodgrass partially atoned with a great catch to retire the next batter, but Engle advanced to third. And after a walk, a game-tying single and an intentional walk, Larry Gardner drove a long sacrifice fly to right field, and Steve Yerkes scored the World Series-ending run. Snodgrass was the anointed goat, and his error would forever after be known as "the $30,000 muff."